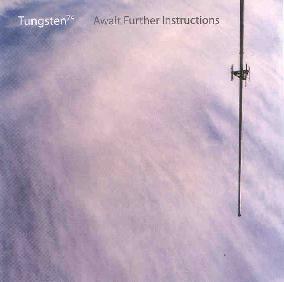 Tungsten74 - "Await Further Instructions"
The second album from these Brooklyn based space rockers is an all-instrumental, musical exploration of rhythm, ambience, noise, and heavy riffing. The band nails down some seriously cool riffs, though sometimes they seem uncertain what to do with them once they've got them. This is a minor thing though, because there is enough variety of rhythms and sonic textures to keep things interesting throughout the length of the album. Electronic bleeps, odd samples, and even a little piano enhance the sound, but at its core is the classic combo of guitar, bass, and drums. Like fellow atmospheric, improvisational bands such as SubArachnoid Space and Bardo Pond, Tungsten74 eschews slick production for a sound that is completely raw and energetic. The difference though is that Tungsten74 tends to rock out a lot more than the other bands, adopting an almost Hawkwindish style at times. And while their music is full of pulsing rhythms and searing guitar, they are not afraid to explore the more mellow and melodic side of things either, as they do on One Minute Eternity I and it's 10- minute reprise, One Minute Eternity II, and on the more upbeat, but still melodic Stop Liking Your Job. Some tracks, like Upgrade to Flash Gordon and Long Hot Naked Winter, are pure soundscape, filled with strange noises, samples, and lots of oozing, buzzing, swirling drones. And then there are the rockers, my favourite of which is the album opener, Generic Foreign Accent, a driving, pulsing number with washes of jittery feedback, which even has a bit of surf rock influence in the guitar work. Nicely done! In short, if you're a fan of any of the above-mentioned bands, Tungsten74 is well worth checking out. For more information you can visit the Tungsten74 web site at: http://www.tungsten74.com. Contact via snail mail c/o Technical Echo Records; 172 5th Ave #51; Brooklyn, NY 11217.